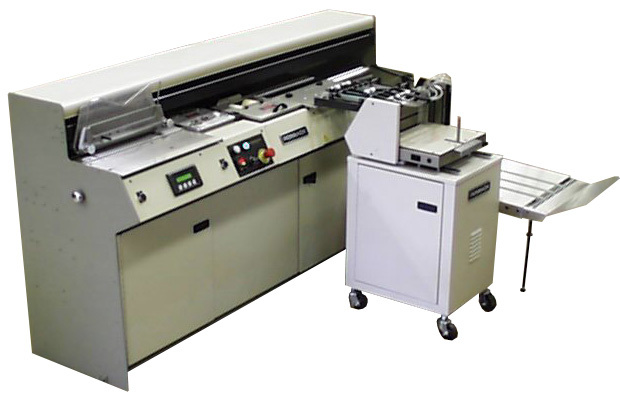 Building bindery equipment since 1881, The Rosback Company builds rugged perfect binding equipment. The model 882 Single Clamp Perfect Binder is able to bind books consistently with strong square spines. It is equipped with a self adjusting nipper, a precise temperature controller, a 24 hour/7 day glue pot timer, twin glue rollers, side gluers for hinge binding and a drop tray delivery. It can perfect bind up to 2″ thick books up to 600 books per hour. The maximum spine length is 15 1/2″. Also available are 17.5″ & 19″ models. The Rosback Model 887 Automatic Vacuum Cover Feeder is for use with any size 882 Perfect Binder.